Contributed by Declan McGuire, The Number Games is another in our series of occasional features. This article originally appeared in the April 2014 issue of Bike Buyers Guide, through which MAG Ireland has been afforded the opportunity to explore some of the challenges facing riders today. Rocket science is frequently held up as the hardest of hard sums, and indeed when we examine some relatively simple numerical problem to which the answer seems obvious enough we’ll often say “it’s not exactly rocket science”. Arguably, the true pinnacle of numerical difficulty is particle physics, a world of subatomic strangeness so fiendishly complex that weird concepts like quantum entanglement, in which a particle can exist in two completely different states at the same time, are considered normal. 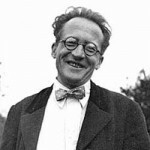 Physicist Erwin Schrodinger famously illustrated this concept with a theoretical experiment in which a cat was sealed inside a box with a mechanism which might or might not kill it. Only when the box was opened would it be known whether the cat was alive or dead. Thus, Schrodinger argued, so long as the box remained sealed the cat was both alive and dead at the same time. MAG Ireland’s remit is to promote and protect motorcycling, and to do that we sometimes have to be dispassionate in examining the hard numbers. There are lessons here that need to be learned. They may be difficult to find, and perhaps more difficult still to accept, but learn them we must. Motorcycling is unique in being as much about emotion and passion as it is about attitude and physical skills. Whereas we might buy a car because it’s big enough to lug the kids and all their kit, we’re less likely to compromise our personal preferences when it comes to two wheels. Put another way, most of us will buy a car with the head and a motorcycle with the heart. That makes it all the harder to connect sterile numbers to the emotions we experience when we drop it into first and let the clutch out, so let’s try to make it easy. Consider the following number. 2,717. It probably doesn’t mean a lot to you at first glance, but according to the central statistics office (CSO) that is the number of new motorcycles which were registered in this country in 1997. Try this one. 6,919. That’s the number of new motorcycles which were registered in this country in 2001, two and a half times the 1997 figure. Now fast forward another ten years through the rollercoaster rise and fall of the celtic tiger and the CSO tells us that the 2011 figure was 1,102 new motorcycles registered. That’s just 16% of the 2001 figure and less than half of the 1997 figure. So what about 2012 then? Cue Bruce Forsyth on Play Your Cards Right. Higher or lower? You guessed it. Just 955 new motorcycles registered in that year. A few weeks ago, the CSO added 2013 to the list and by now you’re probably wondering how bad it gets. Try 878. Stop and think about that one for a moment. In a country with over four and a half million people, there were just eight hundred and seventy eight new motorcycles registered last year. So what of second hand sales then? Well, it’s a little harder to get the numbers on this one. The CSO figures for 2008 and 2009 show there were respectively 4,317 and 4,030 second hand motorcycles licensed for the first time. We can extract the numbers for 2011 when 2,072 second hand motorcycles were licensed, then in 2012 that figure fell to 1,522 and finally the corresponding figure for 2013 was up slightly to 1,687.
workshops simply won’t see sufficient activity in the market to sustain a business. Of course, Ireland is just one country in Europe, so to see where all this is going we need to take a step back and look at the broader picture. ACEM, the body which represents the motorcycle industry in Europe, recently released the provisional figures for 2013. Unfortunately, the picture they paint is one of ongoing deterioration in key markets including Germany, Spain, France and Italy which between them represent the lion’s share of the motorcycles sold in the EU. At the recent ACEM annual conference, manufacturers claimed that the EU now represents just 5% of the global motorcycle market, yet has the highest cost of regulation, and questioned whether to retain manufacturing capacity in Europe, or shift focus to developing countries where the demand for motorcycles is booming. On the plus side, ACEM reports a modest improvement in sales towards the end of 2013, while in the UK, the Motorcycle Industry Association reports a similar modest upturn in sales there. Another positive can be found in the figures for the circulating park – the number of motorcycles on the road – which have not fallen quite as sharply suggesting riders are holding on to their motorcycles for longer as the average age of the fleet increases. 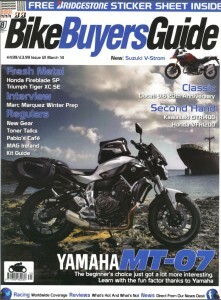 Last month, this magazine carried a feature by Roland Brown in which he enthused about Yamaha’s new MT-07, novice friendly and practical, but fun. A bike which is representative of the manufacturers approach to a key segment of the EU market as it looks today. Increasing regulation has had a chilling effect on motorcycling, yet here is a bike which delivers the goods without falling foul of the bureaucrats and which, above all, is designed to appeal to that most vital demographic, the younger rider. What this bike represents then, is arguably far more important than what it is. It’s a signpost on the road to a sustainable future for motorcycling as we know it. We must all hope the big manufacturers have got it right with bikes like the MT-07. We’ve just seen the first real hints of a return growth in the market. The appalling alternative is that motorcycling, like Schrodinger’s cat, is both alive and dead at the same time. The numbers are stark, but we can all do the maths. It’s not exactly rocket science.